As a former English language student, I’ve developed a love for words and their origins. At university I decided to study both English language and literature and while I adored reading Austen and Shakespeare, I would look forward to my lectures on language where I would find out the history of English language and how it’s used today. I soon began to find that other than my language text books, there were limited books on language that were actually readable and enjoyable so when Paul Anthony Jones started releasing books, I became obsessed. I started off with The British Isles: A Trivia Gazetter, a reference book which gives the origins of the names of towns and cities all over Britain, of course I skipped to find all the places I’d ever been first but afterwards I sat down and read it properly. 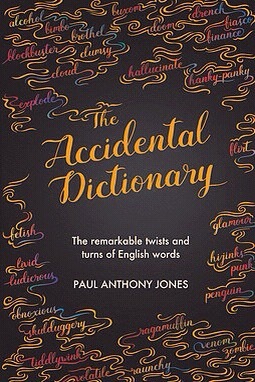 I loved it and I loved every book that followed so when I got the chance to get my hands on an ARC of The Accidental Dictionary, I jumped at the chance. Now as I say, I love words and I’m always on the hunt for a book that will educate me while entertain me at the same time and I have to say this is the perfect combination. The information in the book is accurate and interesting while it has a casual tone throughout meaning it doesn’t read like a school book. Small jokes are placed within the chapters and this helped the flow of the book; although the book is informative, it meant that I didn’t have to take it too seriously. I also like that the chapters aren’t long and too informative, they get the point across without becoming a bore. I was able to read two or three chapters (one chapter = one word origin) at a time and put the book down for a while, I never once dreaded picking it up again as it was an easy read and never felt like a chore to read so at night before I would fall asleep, I was sure to pick Jones’ book and read a little more. There’s not a lot that I can really say about a dictionary, it has words and it explains what they mean (or in this case what they used to mean) but I can say that if you like this sort of thing then it’s certainly worth picking up and reading, it’s a fun read which will teach you a lot while making you feel like a clever person who reads the dictionary. Like me, you’ll probably end up at work the next day explaining to people how the word ‘nice’ meant ‘ignorant’. I’m going to start off with apologising. I’m aware I’ve been a tad awol the last few weeks but I’ve been moving house and between my lack of Internet and the constant stream of visitors, I’ve just not had a chance to post. I’m back now, however, and I plan to stay back. Last week Jake gave us his top five Pokémon conspiracy theories. Now I love Pokémon and I really love conspiracy theories so naturally I read the l straight away before reading it a second time to make sure I took it all in. I chose to start with the worst one on the list – they get better, I swear. After book 6, it is regularly mentioned that Draco is sickly looking and paler than normal. The theory is that after Lucius Malfoy failed to get the prophecy in book 5, Voldemort decided to punish him. We’d previously been told that if someone got on the wrong side of Voldemort, he would use Fenrir Greyback to bite the wrongdoers children by way of punishment which is how he is bought to get revenge on Lucius. We have some evidence to support this theory, to start off with, the book never actually confirms that Draco is a Death-Eater (ignore the films-I’m aware he shows his Dark Mark at the end) so many believe that when Draco goes into Borgin and Burkes at the beginning of book 6 and shows Borgin something on his arm and mentions how he is a friend of Fenrir, he isn’t showing a Dark Mark, he is actually showing off his werewolf bite. Yes, this is very far fetched and yes, J.K. Rowling has confirmed this one isn’t true. I kind of like the idea that Draco’s blood isn’t so pure anymore though. 2 – The Dursley’s are really lovely. They were just moody from being around a horcrux too long. As we know, Harry is a sort of horcrux and in order to save the wizarding world, he had to kill the sort of horcrux within him. We also know that while Harry, Ron and Hermione are on the hunt for horcruxes and are carrying around the locket, they all get really moody because of the evil spirit within the locket. Whoever thought of this theory is clever but it doesn’t really make sense. I mean Petunia was always jealous of Lily and called her a freak when she used her magic… Harry wasn’t even an egg in Lily’s overies at this point never mind a horcrux. 3 – Harry and Ron are actually good at divination. I don’t know if this one can actually be classed as a conspiracy theory because it was probably written into the books on purpose but in Goblet of Fire, Ron and Harry haven’t done their homework for divination so they just make up some stuff. So are Ron and Harry secretly seers? Probably not but I like this one. This one is probably my favourite. The theory goes that after telling one too many false stories, Rita Skeeter was banished to the muggle world. Here she fell on hardliners and took up writing to get by. She decided to write about the most famous boy she knew – Harry Potter. Of course if this one is true then it means that J.K. Rowling is actually Rita and the wizarding world is all real. That’s why this one is my favourite. When I read this one, I was so confused but then when I got my head around it all, it was brilliant. So Harry, Snape, Voldemort and Dumbledore make up the characters in the Tale of Three Brothers. It had previously been suggested that Voldemort, Snape and Harry made up the brothers. Snape was forever in love with Lily and after her death he looked for ways to remember her (the resurrection stone) but in the end he could never really bring her back and so he died. Harry just wanted a peaceful life really (the invisibility cloak) and when his time was up he greeted death willingly. Now to go along with this theory, someone wrote that Dumbledore represents death and it seems to fit perfectly. In the tale, Death gives each brother an item. In the books, Dumbledore makes sure Harry has all three items in the end and just like in the end of the Tale of Three Brothers where the third brother greets death like an old friend, Harry greets Dumbledore like an old friend when he is about to die. J.K. Rowling has even agreed that this one is great so that’s why it’s number 1. So I’ll start by saying this will contain spoilers, I honestly don’t know how to talk about this book without spoiling pretty much everything. You’ve been warned! If you’ve read any of my blogs before or if you’ve ever met me in real life, you’ll be aware that I’m Harry Potter mad and knowing I was counting down the days until the new book was released, won’t surprise you. If you’ve never read a blog and don’t know me then all I can tell you is that I love the Harry Potter series so much that I got a pair of glasses and a lightning bolt tattooed on me. As soon as I found out Harry Potter and the Cursed Child would be released in book form, I jumped on Amazon and pre-ordered it. As soon as the book was posted through my door, I read it and I did so within a 24 hour time frame – something I haven’t done in a long time… Probably not since The Deathly Hallows was released. So where do I start with my review other than gushing about how much I loved it? Well in case you didn’t know, The Cursed Child follows Harry’s middle son, Albus, as he embarks on his own adventures in Hogwarts. Albus soon realises that Hogwarts isn’t all that fun when you have Harry Potter, the greatest wizard of all time, as your father and living in his shadow is pretty hard. Now, once again, if you haven’t read the books, you might want to stop reading. Some major spoilers are coming up. I started crying at the very beginning, as the script picks up where the last book left off, I suddenly found myself overwhelmed with memories of how it felt to be reading the final Harry Potter book and that bit where Harry says ‘Albus Severus, you were named after two of Hogwart’s greatest headmasters’ (this may not be the actual quote, my copy of the book is currently packed up in a box somewhere) will forever make me cry. Now I loved everything about this book, to start with the jobs that the adults have… Hermione as Minister of Magic? Yes please! If there’s a role Hermione was made for, it’s minister. She’s perfect for the role, she has seen how previous Ministers have coped with some of the worst events in history and she seems to have learned from their mistakes. I love that Ron is working for Weasley’s Wizard Wheezes, I’d previously read that he was an auror after Hogwarts and for me the job just never suited him. Although Ron is a great wizard, I love him being the slightly silly fun one of the group and a minsirty job just didn’t seem right to me. And of course Harry becomes head of magical law enforcement, he was always destined to be great and a mediocre job just wouldn’t have worked for him. The star of the show (or script) has to be given to Scorpius Malfoy, after Albus is sorted into Slytherin, he becomes best friends with Scorpius who is just adorable. Scorpius has heard rumours that he is actually Voldemort’s son after a time turner has been used in order to ensure Voldemort produces an heir, now Scorpius isn’t sure what to think of these rumours and constantly worries they’re true. Along with this Scorpius is just a really lovely kid, he’s bullied for potentially being Voldemort’s child but he never seems angry at the other kids in school and he’s nothing but lovely to others around him. Albus on the other hand, is sometimes pretty annoying. He resents his father for being so perfect and constantly seems angry. At first I didn’t like this and I got annoyed at Albus for not realising that his father was forced into being a hero but as I began to read, I began to understand Albus and I started to sympathise. I realised that he just wanted to live the same life that his father had, he wanted to show people that he could be just as great as his father but unfortunately he doesn’t seem to be very good at most magical things so he finds it harder than he hoped. After overhearing a conversation between his father and Amos Diggory, Albus decides he will go back in time with the help of a time turner and he will try to save Cedric Diggory’s life. With the help of Scorpius, he goes back to the Triwizard Tournament and changes two things in the hope that Cedric will win and therefore will never touch the portkey that eventually leads to his death. I LOVED this aspect of the book, the two changes bring about two alternative realities, one where Ron and Hermione never quite get together and one where Voldemort wins the battle of Hogwarts. These brought up ideas that I had previously thought about. The idea of a reality where Voldemort had eventually won was really intriguing to me and I thought it was done incredibly well. The book was pretty light and it felt very easy to read, after about forty pages I knew that I wouldn’t be putting the book down until I was finished and I was so glad that I took the time to read until the end. Overall, the book was pretty much just one big fan fic but who doesn’t love fan fic? Five out of five stars without even a shadow of a doubt. I may be a little late to the party but I’ve turned up eventually. Now for a while, I’ve heard a tonne of people rave about Morgan Matson and Since You’ve Been Gone seems to be THE book of the summer so I finally decided to pick it up and give it a go. Since You’ve Been Gone follows Emily, known in school for being Sloane’s best friends. Most people know Sloane and they’ve seen Emily at her side but they couldn’t tell you Emily’s name. One summer Sloane and her family gone missing, this isn’t uncommon but this time they’re gone longer than normal. Whenever Sloane and Emily have been apart, Sloane always makes a list for Emily to complete, knowing she won’t actually complete it. This year is different; Emily feels that somehow by finishing the list she will fine Sloane so off she sets on her crazy summer enjoying a list of things she would never have done before such as skinny dipping and stealing. I didn’t think I would love this book but I was wrong. I originally thought that I would find it to be yet another young adult book (which it is) that focuses around romance but in the end I realised the focus was primarily around friendship and how important that is in life. While trying to work her way through the list, Emily teams up with the good guy around school, Frank, his best friend and school joker Collins and a girl from the pizzeria she works next door to, Dawn. Although it becomes evident pretty early on that Frank will be a love interest, the story doesn’t focus solely on this. I loved Emily’s relationship with Collins, someone she never normally would have struck up a friendship with yet someone who was willing to accept her into their group without any questions asked. Collins was a character that I generally loved and quite honestly I would have loved to see a little more of him. He’s that person we all know at school who acts silly and makes fun of everything around him because it’s his only way to feel confident. When he meets Dawn, he acts differently because it’s someone he genuinely likes and he’s terrified she’ll reject him. Collins felt so real to me because at that age, I knew a lot of boys like that and Matson paints a perfect picture of a teenage boy. The romantic aspect of the book was done well in my opinion, I liked the fact that it was a little more serious than your typical YA love triangle and instead the issue with the romance was the fact that the love interest is in a committed relationship throughout the story. I liked that this posed a question as to if it’s ok to be attracted to someone who you know is off limits and I found it interesting to read how Emily dealt with the situation and how she struggled with her feelings. Family life played a huge role in the book as it does with a lot of young adult; it was nice to see that there was more than one role portrayed within the book. We had Emily’s family who may be a little strange but there’s no doubt they love each other and although her parents can sometimes be in their own world, it’s clear that they will focus on their children if needed. Next we have Sloane’s family, her parents generally neglect her and leave her to do her own thing. Her parents obviously love her but they don’t seem to be around a lot and they’re not very responsible so Sloane becomes extremely independent. Last we get to see Frank’s parents, a couple who are very successful but who hate each other and are in the middle of a divorce. They’re often seen in public with smiles on their faces playing the happy family but anyone who sees them at home will know the truth. I thought this was interesting to show three very different relationships and to show how all them can be normal and how with good friends who you can confide in, it’s easier to deal with parents who are not always there. Overall I really enjoyed the book, I read it pretty quickly, I enjoyed the writing style and story and it’s certainly a book I would recommend as a light summer read. So we’re over half way through the year and I’m not even half way through my reading goal of 50 books. By now I should be on book 26/27 but instead I’m only on book 24 ao I thought I’d share with you the books I’ve read so far this year. This series follows a girl called Lola-Jean who has loved a few boys in her life but never told any of them. Instead she writes them a love letter which she addresses but never sends, choosing to hide them in a hat box instead. One day she realises her letters have been posted and she now needs to confront each guy. This is a great read and I enjoyed the second book more than the first, a third book is to be released, I only hope it doesn’t ruin the series so far. Maddy is allergic to everything, hence the book’s title. She lives an isolated life with her mother and her nurse, Carla, being the only people she has any interaction with. Maddy is happy with this life until she spots a new guy moving in next door. Olly also has his share of problems at home and strikes up a friendship with Maddy by sending messages through their windows and later progressing to online messaging. Maddy is soon begins to wonder what life could be like outside her own home and realises she has to take a chance in order to live a little. I didn’t hate this book but I didn’t love it either… It was good, I’ll leave it at that. In a world were only men are born naturally; women are now created and trained in the arts of pleasing men. When a woman graduates, they will become a companion, concubine or teacher and most of the girls are aiming to become a companion. Freida and her best friend Isabel have always been two of the top rated girls in school and are sure they’ll go on to become companions. In the final year however, Isabel does the worst thing she can possibly do and puts on weight. Soon Freida realises she has to decide if her friendship is worth saving and she now needs to become the perfect woman all by herself. I loved this book, it was insightful and clever. A collection of short stories about women who were almost famous, some of the women are related to famous people and some are notorious women from throughout the ages. The stories are brilliant and inspiring, they shed some light on how women can do anything than a man can do and often they can do it better. Disclaimer follows two protagonists, first we have Catherine, a prestigious documentary maker who one day finds a book on her nightstand and after a few chapters she realises that it is about herself. The book tells of her worst memory and time that she thought she had passed. Our second protagonist is Stephen, the author of the book and a man who holds a grudge. This book was great, it was full of twists and each chapter ending made me want to read more. I’m sure we’re all familiar with the Harry Potter series by now, it feels like not a week does by without mentioning my favourite book series. Quidditch Through the Ages is a book which is read within the book series (book inception) and was brought to life for Comic Relief. The book tells us the history of the game of Quidditch and explains a lot of the rules. This book follows Tochtli, a child of a famous drug baron, who is living the life of luxury. He lives in a house big enough that he describes it as a palace, he has his own zoo and he has no need to leave the house; everything he needs is brought to him. He does however, have a house which often has hit men and prostitutes passing through. Tochtli’s only want is to have a pygmy hippopotamus to add to his zoo. This book is tiny and can be read in a matter of hours or possibly less depending on how fast a reader you are but it’s brilliant. On his sixteenth birthday, Rory is sitting by the beach when a storm hits and he has to run for shelter. He realises that he’s not alone in the shelter when he comes across Lorali, a naked girl who he instantly feels he needs to protect. It soon becomes apparent that there is more to Lorali than first meets the eye, she is actually a mermaid who rejected her life under the sea but a number of people turn up at the same time as she does and it seems that they’re determined to bring Lorali back home. I was a tad disappointed with this one, I thought I would love a book about mermaids but I got bored after about 10 pages. hen she meets a good looking man (still married) who she begins an affair with. It’s an honest telling of life after your world changes and how with good friends and strong will, you can get through anything. I thought this was great, it was nice to see a story that is real and unashamed. When Libby is a child, her mother and sisters are murdered. Libby hides throughout the whole situation but acts as a witness, at age seven, to give evidence against her brother who she thinks she heard killing the rest of her family. Twenty-Five years later and Libby is no longer able to survive on the charity money given to her as a child so she seeks other ways to get money. She comes across the Kill Club, a group who are interested in serial killers and where she realises that she might have been wrong about how her family died. I still can’t tell you how I feel about this book, it was great but disturbing. The book series which the UK TV show, Vera, is based on. This is the seventh book in the series but the only one I’ve ever read. Each book has its own story so I don’t feel it’s essential to read them all before starting this one. This book sees two bodies being found in a small town not far from Newcastle. The victims seem connected but their bodies were found apart. Vera must get to the bottom of the murders and work out who the killer was. I’ve honestly forgot who the killer was already but I enjoyed the book, it wasn’t full of suspense but seeing as I’m from Newcastle, it was great to read about places close by. I’m sure I don’t need to explain these books. I re-read 1-4 last year and finished my re-read this year. I loved them. As I always do. My five favourite things about Harry Potter. Again, I don’t feel like I need to explain this series and even if I did, I don’t know how I would. Way too much happens in these books to really explain. I hope to finish the rest of the books by the end of the year but I’m listening to audio book versions of them and at 40+ hours per book, I’m not sure if I will. The second book in the ACOTAR series, this book sees Feyre, newly turned fae and living with the fae who she believes to be the love of her life, Tamlin. Tamlin however keeps Feyre locked up and wont allow her to leave the safety of their estate in fear she will get hurt. Move aside Tamlin and allow Rhys to enter. Rhys rescues Feyre and allows her to become part of his close-knit court where she learns to use her newfound fae skills and fight for herself. I completely loved this book, along with the rest of the world, I thought it was great. Like Disclaimer, this book has two protagonists, Marie-Laure and Warner. Marie-Laure goes blind at a young ages but lives with her father who takes her with him every day when he goes to work at Paris’ Natural History Museum. As WWII progresses they realise they must leave Paris and with them they take a beautiful diamond which they plan to keep safe for the museum. Warner is an orphan who has a great skill at fixing radios. He eventually becomes part of the Hitler youth and progresses to be one of the best soldiers on field. Marie-Laure and Werner eventually meet and the book follows their childhood to show how this happens. I honestly didn’t feel anything for his book, it was well written but none of the characters felt real to me. I had to check Goodreads to check what this book was about despite the fact that I only finished it a matter of weeks ago… It follows Amy who clearly has an eating disorder and who has just recently lost her best friend. She’s not completely happy in her marriage so when he husband goes away for a week on business, she leaves for Paris. I just didn’t care for this book. Amy never seemed to get over her eating problem and I don’t feel like it was ever explained that her eating disorder was a bad thing. I love Paris but this book just didn’t give me what I needed. Lakshmi is thirteen and lives in the mountains of Nepal with her mother and step-father. Lakshmi enjoys school and looking after her goat but she can’t deny that her family have money issues. To rectify this, her step-father decides to sell Lakshmi to what she believes will be a rich family within the city where she will be a maid. It soon becomes apparent that she will not be a maid and she will actually be a prostitute, living a life she is desperate to escape. This was a brilliant book and a must read for anyone. It’s insightful and intelligent and at times it broke my heart. Another popular book series that I’ve started to read. There’s soon to be a Netflix TV show released and I decided to read the series before the show starts. I like the books but have series concerns about why there are no responsible adults looking after the children. I never read these books as a child so I don’t think I have the same emotional attachment as most do. I’m fully aware that I’m obsessed with Harry Potter, it’s an addiction that I never plan to get over. I find that there are very few people who have never read Harry Potter or who have not seen the films but if you are one of these people then you may want to not read this because there may be some spoilers. Now this may seem obvious but recently I’ve realised that not everyone loves the same characters, I’ve just re-read the series and once again I fell in love with Snape and cried my eyes out when I once again read about his undying love for Lily, I laughed when Fred and George left Hogwarts and my heart broke when Fred died. I’ve always been a big fan of the twins and Snape and I’ve always felt a strong connection to the strong female characters that are Ginny, Hermione and Luna. I did recently find out however, a lot of my friends disagree. I have a friend who hates Snape and a friend who will always tell me how annoying she finds Ginny, to counteract this, I never really warmed to Dobby (please don’t hate me) and felt no emotions when he died. I love that the characters are so real and have such depth that the reader can get to know them and essentially form an opinion of them. My favourite parts of HP will always be the scenes with the pensieve, I love going back in time and rooting through peoples memories. I thought that J.K. Rowling’s invention of the pensieve was a perfect way to show us exactly what happened and explain the story a little more. The Half Blood Prince is my favourite book and a lot of this is based on how we can go back in time and understand Riddle a little more. I loved seeing his upbringing and how he came to be Voldemort, knowing that he hated life at the orphanage and how his magic powers made him feel special, made it a little bit more understandable why he wanted to become powerful. I read a lot of books and I have a love for young adult and contemporary fiction but often with these genres I find a lot of female characters who I hate because they seem to live their lives around finding a boyfriend and nothing is more important to them. Harry Potter literally has the opposite type of women, Hermione being the lead example. Yes Hermione falls in love with Ron early and it seems pretty obvious from Goblet of Fire onwards that providing both them survive, they will eventually be together but this is never what Hermione was about. We loved her because she was strong and was always the rational one, she valued her friendships with Harry and Ron more than anything else in the world and she was the one who stuck by Harry through thick and thin. She was clever and funny and beautiful all at the same time. Let’s be honest, if Harry hadn’t made friends with Hermione, he would have been dead before he even found the philosopher’s stone. On top of this we have the likes of Luna who is eccentric and weird but she’s comfortable in her own skin and never tries to change who she is just to fit in, finally she finds her best friends by just being herself and we have Ginny who starts off as a giggly schoolgirl who swoons over Harry but it’s not until she’s over him that she actually grows a personality. Ginny is strong willed and feisty and she refuses to go home in the battle of Hogwarts, she knows she is at risk but she can’t sit back and do nothing. I love how J.K. writes all her main female characters as strong women who girls can admire and look up to. We’ve all wanted to fly on a broom and hit balls through a goal, right? Quidditch is on my list because I simply love the fact that it has become a real sport. There’s nothing more entertaining than going to a university quidditch game and seeing a group of 20 year olds running around on brooms pretending they’re flying. Before you accuse me of mocking the sport, I’m really not. I genuinely love that Harry Potter is so important to people that they’re trying to bring the fictional sport to life. I’ve always wanted to play seeker so maybe one day my dream will come true. This one sounds obvious but for me the magic is so much more than just the spells they perform in the books. Earlier this year I visited Warner Bro studios where you can walk around and look at the sets they used in the actual movies and to me it honestly felt magical. Within five minutes of me being on the tour, I was close to tears because it was all so overwhelming to me. The magic in the books is brought to life, you can perform spells and drink butterbeer, you can take the train to Hogwarts and you can fly on a broom. This is only one part of the Harry Potter world, there is a huge theme park in Orlando and all over the world there are places to go for Harry Potter lovers to make the magic come to life. Ultimately, I love that Harry Potter is so big that it’s more than just a book, it’s a community. I love that if I meet someone new and find out that that love HP, I know I’ll be able to talk to them for hours. Basically, I really, really love Harry Potter. I’m addicted to Paris. There, I said it. Around six year ago, my best friend and I decided to travel to Paris, this was my first ever real visit to the city (I’d previously stopped off for a ten minute break while en route to Spain) and the beginning of my obsession. Once I was home I missed Paris more than I can explain so I decided to pretend I was still there by living through books, soon I realised I’d read quite a few books set in Paris and I thought I’d share my favourites. I wasn’t sure about this book when I first picked it up. It ticked a box by being set in Paris but I’d seen a number of mixed reviews, it seemed some people loved it and some people hated it. The book is translated from French and follows Renée, a concierge for an elite Paris apartment block, who is seen to be fat, lazy and addicted to TV by the residents of the block. In reality Renée is well cultured and actually loves philosophy and art. Paloma is a resident, a twelve year old genius who plans to kill herself on her thirteenth birthday. The two form an unlikely friendship, they both hide their true selves from the world and this forms a strong bond between the pair. When I first went in to read this, I was worried that the book would be pretentious and boring. I couldn’t have been more wrong. I fell in love with Paloma instantly and cared about her more than I’d cared about a fictional character in a long time. The story was charming and the bond between the two characters was heart-warming. A romance novel set in Paris during the war? Sounds like everything I’ve ever needed from a book. It was. Hore’s A Week in Paris was everything I look for in a book. Fay was born on the day WWII started but she can’t remember the first five years of her life, she has a photograph of her dad but again she cannot recall him, she only knows what people have told her, that he died in an air raid. On a trip to Paris with her orchestra, Fay feels a bond with the city and a feeling she has been there before. She sets out on a quest to learn more about her mother’s past and her own childhood. I honestly can’t recommend this book enough. The story was beautiful and seeing a young mother struggle to keep her child safe during WWII was endearing. Before I started the read I assumed it was your typical chic lit read but after a few chapters I realised it was much more than that. It was an enjoyable read and I would tell any of my friends to read it. I laughed and cried all the way through. This was the first book I read by Harris and instantly I knew I loved his writing. An Officer and a Spy follows Georges Picquart, an ambitious officer who has just been promoted to head of counterespionage. Picquart has been pivitol in the case against Alfred Dreyfus, a Jewish officer, convicted of treason. At first Picquart is sure of Dreyfus’ guilt but as things progress he realises it may not be as black and white as he thought. This is based on a true story and after reading I was surprised by how easy I found it to read. At times I cried and at times I rejoiced but in the end I came out feeling like I’d read about an important part of history and was better off for it. Charlotte has everything she’s dreamed of. She’s a French teacher with her dream of moving to Paris to study at the Sorbonne University with the love of her life, merely days away. Then she finds her finacee’s secret online dating profile along with the messages he’s been sending to a beautiful redhead and her life is thrown into turmoil. Charlotte confronts the situation and decides to move to Paris alone where she can forget her past and embark on a new adventure. Now I loved this story, this was the first book that really made me want to move to Paris. I loved seeing Paris through Charlotte’s eyes and you could tell that the author loved Paris just as much as I did, if not more. The story and the characters felt real from the beginning, I felt Charlotte’s struggles and I felt her love for the city and the new friends. And can we just take a second to appreciate Luc… Perfect fictional man alert! Now this is the biggest chic lit novel on the list. Anna works in a chocolate factory in England and she loves her job but after an accident at work she finds herself jobless and very upset. While recovering in hospital Anna meets Claire who helps to teach Anna French during their time in hospital. To help Anna recover, emotionally and physically, Claire offers to help Anna out, she puts her in touch with an old friend from Paris who offers Anna a job in their chocolate factory. Anna soon finds out that Parisian chocolate factories are a lot different than English and she realises that Paris might be everything she needs. This story was beautifully written, I’d previously read a Colgan book before but struggled to get into it. This time however I was hooked within a few pages. The description of Paris was beautiful and after reading, all I wanted to do was run around those cobbled streets with an attractive Frenchman on my arm.